Forget Mondays, get back in bed! 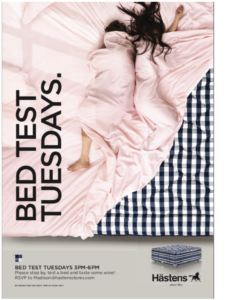 Tuesday is “Bed Test Tuesday” at Hastens New York, located at 1100 Madison Avenue. Stop in 3-6pm to test a bed & enjoy refreshments. RSVP to madison@hastensstores.com.